Economic Downturn: To seek healthcare or holdback? 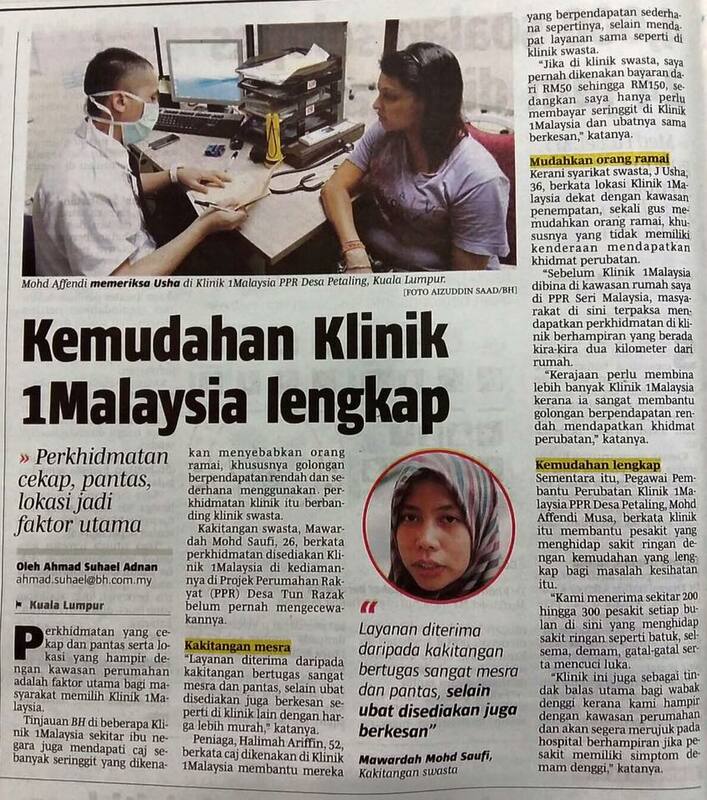 The Ministry of Health (MOH) is responsible in providing healthcare services to all Malaysians and our facilities will not deny treatment or admission for those who require medical care. However, as a government agency, our focus in healthcare delivery is especially on the vulnerable groups who depend on the government services for their healthcare needs. Findings from the 2015 National Health and Morbidity Survey (NHMS 2015) have shown that the Malaysian health system does well in financial protection and with a relatively low catastrophic expenditure at 0.3%, which is one of the best performers in the world. Financial risk protection in Malaysia shows that the poorer segments of the population are more protected versus those with higher disposable incomes. The rich utilise the private sector more while the poor use the public system more. In addition, user satisfaction with the public health system is high as the NHMS 2015 showed that over 80% of the public indicated they will seek public health services if they experience serious health problems (e.g. for surgery and deliveries) while they prefer to access private health services for minor ailments. The Malaysian public perceives the public health system to be responsive, with the exception of waiting time and choice of doctor, while being unhappy with the cost of private healthcare services. With the current rise in living expenses and escalating healthcare cost, the public would seek ways to optimise their expenditures especially those without health insurance or employment medical benefits and hence may turn to alternative options. MOH views that holding back on seeking treatment is not a good option as in the long run it would cause even more complications. MOH has also been working hard to improve our healthcare services at our facilities to earn the public’s trust and therefore we have reported an increase of people seeking treatment at government hospitals and clinics. However, we do not have data from the private sector to compare with. MOH has seen a steady increase in demand for our services over the years and therefore we have always been looking for ways to cope with the burden. The current economic situation has caused a surge in the demand for our services but with the current strategies we have implemented, we are well prepared to face this surge in the demand. In addition, the Ministry has also planned for the development of new primary care facilities in line with the increasing work burden of the existing clinics as well as to be in alignment with the development of the country. 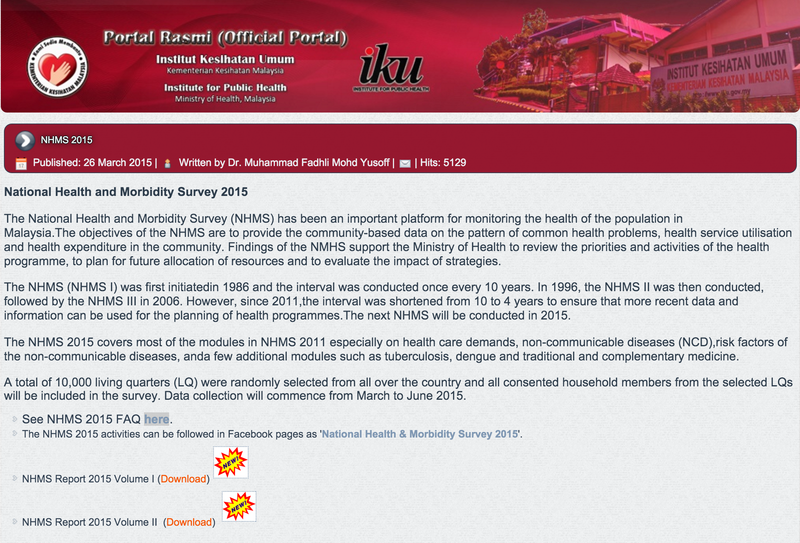 The Ministry of Health plans to increase the number of facilities being built, especially the K1M (Klinik 1 Malaysia) which can be operationalised in a relatively short time period, as these facilities are rented at suitable premises in urban areas, instead of building new clinics. Furthermore, with this increase of new facilities we have also increased our staff, on average 9% annually. The scope of services in primary care has also been expanded to meet the needs of the population. For example, in our K1M, from the original treatment of minor ailments, the services have extended to include maternal and child health services, doctor services as well as treatment of chronic diseases. We have extended the operational hours of our clinics, a total of 71 urban clinics provide extended hours (after office hours, till 9.30 pm at night on weekdays and open on Saturdays from 8 am till 12 noon). Our K1M are open from 10 am till 10 pm daily, including weekends. The clinics in the rural areas offer emergency services after office hours with our staff providing on call services. As the attendance to our facilities increases, congestion is expected to happen and this will lead to long waiting time, patient dissatisfaction, stress among staff, etc. Even under this tight situation, we will still uphold our policy of patient safety and quality care. Increasing the number of beds by building new hospitals and upgrading current existing facilities. Improving and expanding day care services to hospitals throughout the country to decrease inpatient demand. Extended working hours e.g. Saturday Operating Theatre (elective surgeries done on weekends) and Klinik Selepas Waktu Pejabat. Encourage networking between hospitals with specialists and non-specialist hospitals to optimise resources. This has officially been done through the hospital cluster projects. Improving home care nursing, home based palliative care and community rehabilitation psychiatric care to decrease burden of inpatient care without neglecting patient care. Lean healthcare initiatives have been implemented to improve work processes and efficiency. Reducing waiting time through block appointment in specialist clinics and restructuring work processes and work flow for efficiency. Upgrading of the rural clinics (Klinik Desa) to health clinics (Klinik Kesihatan) based on priority and needs of the health in a population. Providing scope of services which include mobile health clinics, outreach health programmes, flying doctor services and provision of healthcare service in remote areas by visiting Medical Officers as well as Family Medicine Specialists. Extending the operational hours of our clinics, which provide extended hours (after office hours, till 9.30 pm at night on weekdays and open on Saturdays from 8 am till 12 noon) while our K1Ms are open from 10 am till 10 pm daily, including weekends. Lean healthcare initiatives have been implemented to improve the work process and efficiency. Ensure the level of knowledge and competence of clinic support in line with the needs and development of the latest medical technology of pathology services, diagnostic imaging and pharmacy at primary care level. Implementation of services such as IT system (Teleprimary care), home-based card, fast lane, emergency alert system and drive through pharmacy to improve the work process in the clinics. On an end note, I would like to convey my sincerest appreciation to all our dedicated healthcare staff for their continuous, selfless sacrifice and professionalism in delivering healthcare service to the Rakyat. Selamat Bertugas Warga KKM!